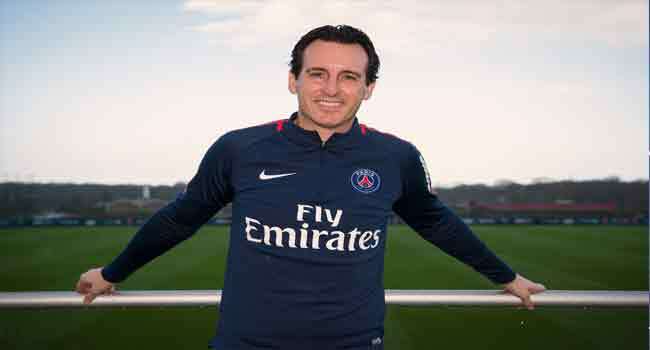 Paris Saint-Germain coach Unai Emery said the club must continue to strengthen as the French champions try to transform their dominance at home into success in the Champions League. Angel Di Maria and Giovani Lo Celso scored twice as PSG secured a fifth Ligue 1 title in six seasons on Sunday with a 7-1 rout of last year’s champions Monaco. Rony Lopes pulled a goal back for Monaco as he scored for the eighth game in a row, but Di Maria added a fifth before Radamel Falcao turned into his own net and Julian Draxler struck late on as PSG romped to the club’s seventh championship. “Other teams have more titles than us. Monaco, Nantes, Saint-Etienne, Marseille, Lyon…but we must keep on building,” Emery, who is likely to be replaced in the summer, told Canal+. With a fifth successive League Cup already won, PSG completed the second leg of a domestic treble — they are also through to the French Cup semi-finals — and could yet break their record 96-point haul from the 2015-16 campaign. PSG also became the first team in Europe’s top leagues this season to reach 100 goals on a night they were without the injured Neymar and Kylian Mbappe, the teenager left on the bench after a bout of illness. But a second successive last 16 exit in the Champions League means heads will roll at the end of this season in preparation for another attempt to muscle in among Europe’s elite. “That defeat (to Real Madrid) hurt us but we continued to work with the players, the staff and the president who is always at our side,” said PSG captain Thiago Silva. Monaco arrived in Paris unbeaten on their last eight league visits to the capital but any prospect of them prolonging PSG’s wait for the title quickly eroded. Kamil Glik’s absence in the heart of the visiting defence was acutely felt as Lo Celso started the move that resulted in the opening goal on 14 minutes, sauntering into the box to tap in a Dani Alves cross. While Cavani’s second half of the campaign has proved less prolific than the blistering spell that yielded 19 goals before Christmas, the Uruguayan bagged his league-best 25th goal with a powerful header from a Yuri Berchiche cross. Cavani then released Di Maria with a superb hooked pass from inside his own half and the Argentine raced clear before lifting an exquisite chip over the advancing Danijel Subasic. Javier Pastore supplied Lo Celso to head in PSG’s fourth on 28 minutes and Monaco suffered further misfortune when France international Djibril Sidibe was stretchered off with a leg injury, a worrying sign for Didier Deschamps ahead of the World Cup. Monaco briefly held up the onslaught as Lopes turned home an Almamy Toure cross seven minutes before half-time for the in-form Portugal international’s 13th goal this term. But PSG continued to attack at will and Pastore’s nonchalant assist for Di Maria allowed the winger to grab his second of the game on 59 minutes. The hosts were gifted another goal when Falcao’s attempt to clear a corner went horribly wrong, summing up Monaco’s misery as the ball looped beyond Subasic on 77 minutes. Germany international Draxler rounded out the demolition, firing home via a deflection as PSG clinched the title at home for the first since 1994 while shattering Monaco’s 17-match unbeaten run. Monaco later tweeted that they would reimburse the fans who had made the fruitless trip to the capital.